This is a skull of a Great Horned Owl (Bubo viginianus). 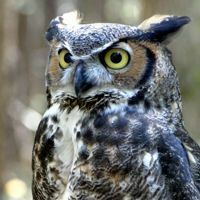 Great Horned Owls are formidable predators capable of feeding on medium-sized mammals such as skunks and rabbits although they more typically prey on rodents and other small mammals. The robust curved beak and large eyes reflect their highly predatory lifestyle.